One of the toughest times in football is the summer break. It’s not only hard for the fans, because there isn’t any football, but it’s hard for the players as well. However, the summer break is equal to pre-season, and the mission to get ready for a new season of challenges. The summer break is here and it’s time to choose your weapon for the pre-season mission. The Stealth Ops Pack is all about giving the players the boots they need, to get ready for a new series of challenges and trophies. Made in a classic blackout colourway, with silver-ish details that gives the boots a lethal touch. This pack is more than just blackout. 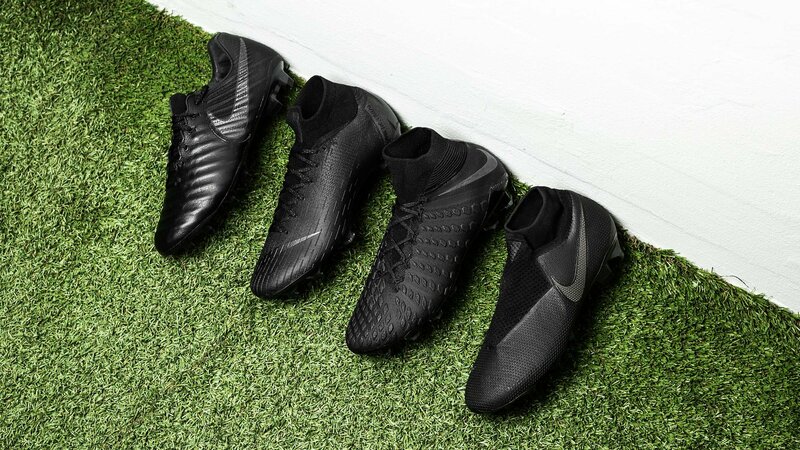 The Pack will give us the first ever blackout Superfly 6 and Vapor 12 boots and the new PhantomVSN boots. The Mercurial Superfly and Vapor are made with metallic details which gives the boots a stealthy look. Made for the players who use their speed to strike and end everything before anyone noticed it. Furthermore, an iridescent effect is added to the Swoosh and the ‘M’ on the heel, to finish the simple design. Moving on to the Hypervenom and Tiempo. The Tiempo is, as per usual, kept simple to maintain the classy tone of the leather boot. Besides completely black, the boot also features a metallic iridescent look. The Hypervenom is a bit more detailed than the other boots due to the pod structure on the forefoot. The metallic or silver-ish tone is placed between the pods, which gives us a look of a silver net, which is placed over the boot. The heel of the Hypervenom also features the metallic branding. Read more about the new Nike PhantomVSN boots. Learn more about the latest technologies. Lastly, we mustn’t forget the newly added weapon to your loadout. The boot which is made for The General of the mission, the player who orchestrates the attacks with his deadly vision. The Nike PhantomVSN is made with different shades of black due to the different textured Flyknit areas of the boot, while the metallic brands finishes the look. Have you found your weapon for the pre-season? Then gear up, brief the tactics and work hard for the new season! The Stealth Ops Pack is made for you who wants to change the game. The Stealth Ops Pack will be available from tomorrow at Unisport. Get your boots and get ready for the pre-season.